Long-serving kit man Ian Helliwell and physiotherapist Kristian Thackray have both left FC Halifax Town. 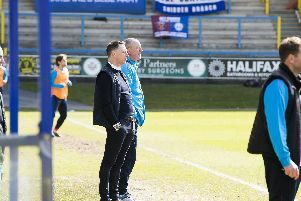 Helliwell has been involved with the old and reformed Halifax Town and has been a popular and well-known figure at the club, especially with the players, past and present. The club have said they will be holding a testimonial during pre-season in recognition of Helliwell’s long service to the club. New members of Billy Heath’s backroom team are expected to be named shortly.